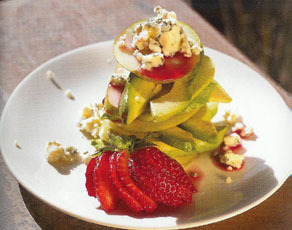 Alternate slices of pear and avocado on a plate (about ½ each per person). I think blueberries sprinkled on would be nice as an alternative. Sprinkle each plate with about 1 Tbsp of blue cheese. Pour a little port over each plate. Grind on a bit of black pepper. Sounds weird, but it was really quite delicious all together.